I have posted before about making my own salad dressings, using a small jam jar to mix them up. This time I am experimenting with the Pequea Valley yogurts we get in our Friends and Farms basket. Last week I chose maple (partially to use with the granola I have been making). 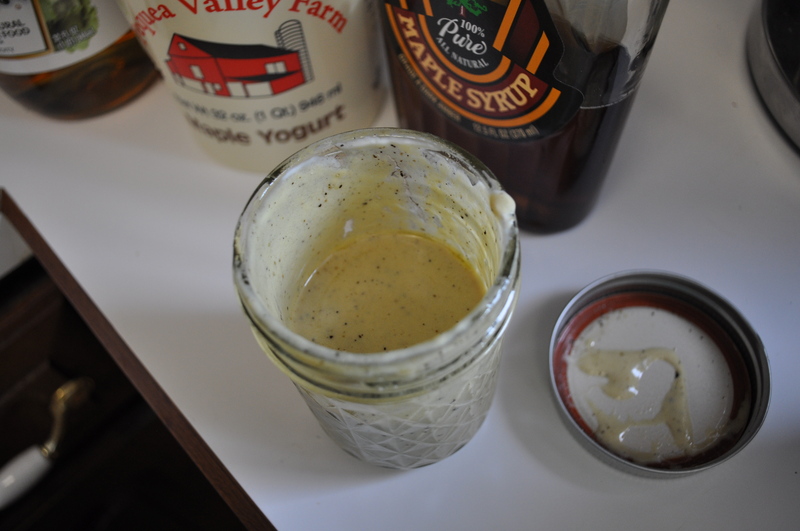 Maple yogurt makes a very flavorful dressing with mustard. These are the primary ingredients. Equal parts yogurt and mustard. I used 1/4 cup each. You can double or triple this recipe depending on the number of people you are serving. I got about five ounces of dressing using this recipe. Enough for at least four salads. The original recipes I found in numerous places on the internet. They used plain yogurt with maple syrup added. 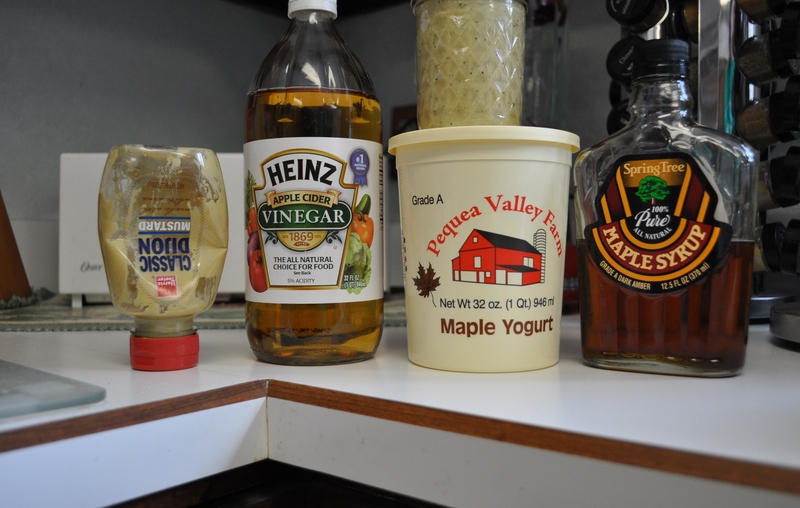 I used this delicately flavored maple yogurt, with one tablespoon of pure maple syrup added. Two tablespoons of olive oil. One Tablespoon of apple cider vinegar. Salt and pepper to taste. Tonight I served it over romaine, with chopped carrots, celery, scallions, radishes and shaved Parmesan. The other half will be served with some garlic sausage tomorrow night for dinner. My husband liked the thick rich taste of it, and said it would make a great dipping sauce for sausage. Making homemade dressing is simple. Plop it all in the jar, cover it, and shake. No preservatives. No extra sugar. You can adjust the amount of maple syrup, and use plain Greek yogurt for a thick dressing. PS, it is also way less expensive than buying those jars of dressing in the stores. Posted in Food, Friends and Farms, Local Businesses, Real Food and tagged cooking, Food, foodie, local businesses, real food. Bookmark the permalink. so simple. It always aggravates me how people BUY dressing. We always have our fridges stuffed with condiments anyway, most likely all the ingredients to make it at home are already there! I’m so pleased to have empty jam and jelly jars available again–we were scrambling to put stuff up for so long it’s a luxury. I’ve never seen maple yogurt, but this sounds pretty good to me!